Cate Tolnai is the Director of Member Engagement for CUE and is in her 15th year in k12 education. She taught middle school and worked as a district TOSA as well as district and county level administrator. She is dedicated to making the lives of teachers and administrators in California a little smoother, safer and engaging. Cate Tolnai loves to talk digital badges, gamification, personalized PD, web tools, and all things awesome. 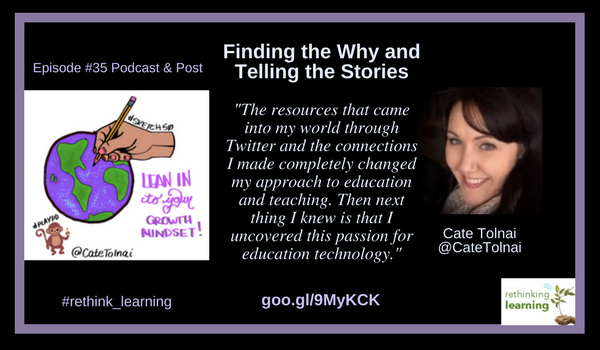 I’m so fortunate to have known Cate for some time through CUE and so lucky that we found time to have a conversation. Below are resources and a few excerpts from the podcast with Cate. I’ve been married for eight years to a great guy named Chris and have two kids, a five-year-old and two years old. We have a Chihuahua mix that is 22 pounds. We live in San Jose, CA. My son started kindergarten this year and I am so unprepared to be a kindergarten parent to figure out this homework stuff and all of it. This is my 15th year in education teaching mostly English and History in middle school. In 2011, I was in a webinar about TCI (Teacher Curriculum Institute) on how to become a teacher. After that, I started my professional Twitter account in January 2011. 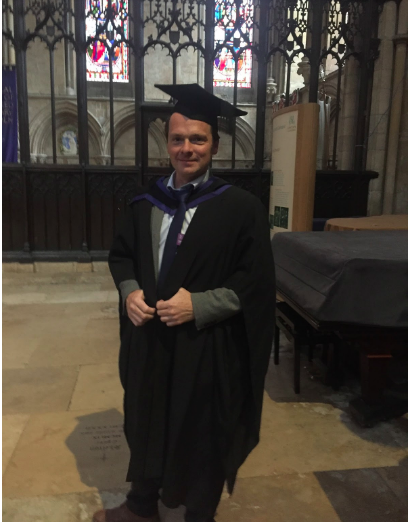 The resources that came into my world through Twitter and the connections I made completely changed my approach to education and teaching. Then next thing I knew is that I uncovered this passion for education technology. Through Boise State, I took their technology specialist certificate program and took two courses from Dr. Jackie Gerstein @jackiegerstein and my world was changed. I realized this was it and what I want my world to be. I then pursued leadership positions and that’s when a TOSA (Teacher On Special Assignment) position became available. We moved to Sacramento, CA and became a TOSA. After two years, that lead to my role in Santa Clara. I then became a Technology Specialist for the Santa Clara County Office of Education where we called ourselves Super TOSAs and moved to San Jose. The team is amazing who have passion and dedication for the work they do with educators in the Silicon Valley. In my role as Director of Member Engagement for CUE, the team allows so much flexibility and room for passion. I was brought on specifically to take the lead on marketing and communication which means I’m the point of contact for independent contractors, graphic designers, supporting the blog, or redesigning the website. The line I love is that I am the protector of the CUE Story. That was part of the application that I have always been so intrigued about finding their why and telling their story. Knowing that that is my major role for CUE is such an honor. But I am still on top of professional learning and doing presentations for CUE. I’m rethinking and re-imagining what professional learning means for CUE. I always have been a doodler and when you move to digital, I lost touch of doodling. Now that I have the digital tools that allowed me more freedom accessibility with my processing. I’m pretty good at copying other people’s ideas and then make it my own. 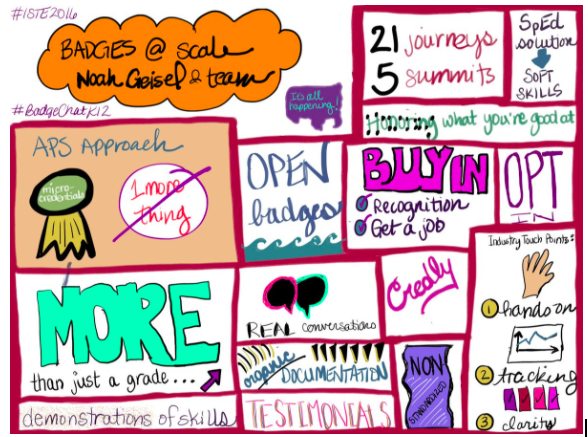 When I saw the influx of sketchnoting, it played a huge role that it made the environment safe to share. At ISTE in 2016, I was part of a session with Sylvia Duckworth @sylviaduckworth on sketchnoting and asked her questions about sketchnoting. With practice comes improvement and I love sharing someone’s session live with something that visual that resonated in the office. When I started as a TOSA, in 2013 I uncovered a MOOC (Massive Open Online Course) that anyone can take on open source learning. I was intrigued and that we can learn from each other. There was no way for me to show what I learned. What if there was a micro-credential or badge to show my informal learning? I submitted to do an Ignite on Digital Badges. 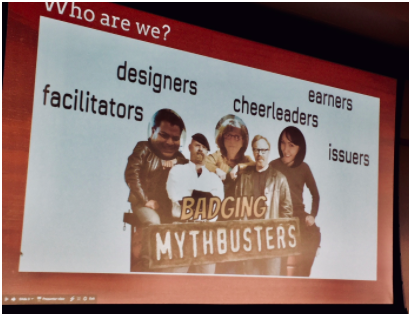 I like make it clear that digital badge and micro-credentials is one part of gamification. I had the opportunity to have a podcast with Brent Coley. What if we give teachers a choice in their professional learning, they receive points, we laugh when someone fails. We can embrace gamification at the professional level. Higher ed and teacher education is not at that point. There is a disconnect but it will happen. 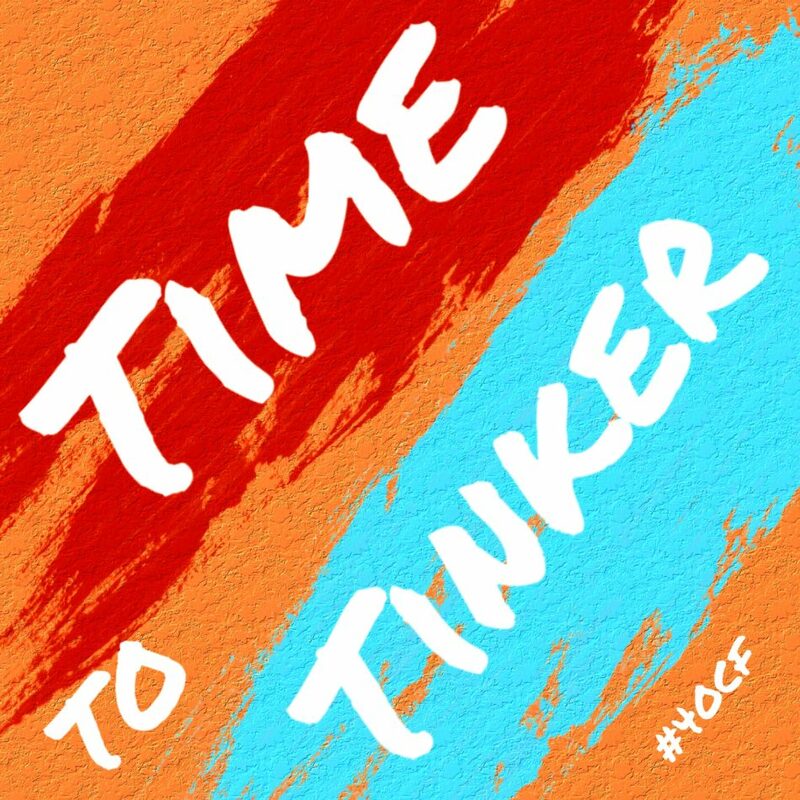 I am totally inspired by Adam Welcome @awelcome and Todd Nesloney @techninjatodd that I get that kids deserve it. How do we wrestle that teachers deserve it too? Being the chief storyteller so all of us are telling the stories. The divide between administrators and leaders who are willing to try it with the ones that are not ready yet. It is okay to be okay with that. If kids deserve it than teachers need to have it. Teachers need to be valued. Cate Tolnai is the Director of Member Engagement for CUE focusing on Lead Learners, a member at large, Learning Networks, Social Media, Press Relations, and Communications. She has been an Academic Technology Specialist for the Santa Clara County Office of Education and been researching and advocating for gamification of professional learning since 2013. She supports teachers and administrators in their efforts to integrate competency-based professional learning and digital badges at their school sites, fosters industry and community partnerships, and stays connected to the badging community through social media, conference presentations, and consulting. Humans are naturally social beings. It is all about the relationships we build and grow. The better the relationships are at school, the happier and more productive students and teachers will be. When we have positive relationships, everything we do will be more enjoyable. When relationships are working, everyone is happier, more innovative and creative. Put aside at least two weeks at the beginning of school to build a caring, compassionate culture before jumping into academics. The more you get to know each child up front will save you time later worrying about discipline and behaviors. Trust is the foundation of every good relationship. If you trust the people at school, you can be open and honest with your thoughts and actions. Put time aside to discuss issues and let everyone have opportunities to speak. If there is a conflict, give time and support for the people involved to resolve it. When you respect the people in your school, you value their input and ideas, and they value yours. Working together, you can develop solutions based on your collective insight, wisdom, and creativity. Mindfulness means taking responsibility for our words and actions. Those who are mindful are careful and attend to what they say, and they don’t let their own negative emotions impact the people around them. People with good relationships not only accept diverse people and opinions, but they welcome them. For instance, when your friends and colleagues offer different opinions from yours, you can take the time to consider what they have to say and factor their insights into your decision-making. Relationships take time to develop and grow. Devote a portion of your day toward relationship building, even if it’s just 20 minutes, perhaps broken up into five-minute segments. Show your appreciation whenever someone helps you. Everyone wants to feel that their work is appreciated. So, genuinely compliment the kids and other teachers when they do something well. This will open the door to positive relationships. Kindness first. Everyone has other things happening in their lives. Practice empathy so you can understand what others might be going through. Be aware of the child who is alone or depressed, reach out, and listen. Kindness always. Teachers can be the role models for positive relationships. We need to be mindful, kind and accepting of all the people in the school. All of our kids look to us for guidance. We need to reach out to those children that need the extra time to listen, really listen. We need to build the relationships with the other teachers and administrators and be careful what we say even in the staff room. Building positive relationships with students, teachers, and all school staff in school will spill over to the school community. Parents will feel more comfortable when their children are happier and feel cared for at school. Kids today need other kids and the world can be a scary place. We need to model kindness and be there for each other. 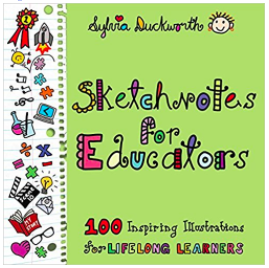 Sylvia Duckworth is an author, sketchnoter, AIM French teacher recently retired, Tech Coach, Google Certified Innovator, and Apple Distinguished Educator. She has more than 30 years of teaching experience in the public and independent school systems in Toronto, Canada. 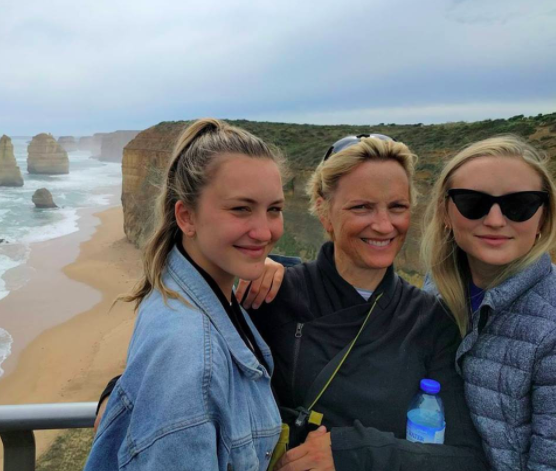 My husband, Steve and I have two lovely daughters, Alana who is 27 years old is in media, and Lauren who is 25 years is a teacher who taught a year in Australia and is now teaching in New Zealand. I taught French for most of my career. Last year, I had a 30% role as a tech coach at my school. For the past 21 years, I taught at Crescent School in downtown Toronto which is a boys only school grades 3 to 6. I recently retired. We have this wonderful program when you combine your age with the years you’ve been teaching and it adds up to 85, it is called the 85 factor. Then you can retire on full benefits. So my number came up in April so I’ve been retired since July. That’s why I’ve been doing so much traveling. It’s been a really busy fall and winter. Been to Moscow, Australia, Singapore and been invited to wonderful conferences. I retired from teaching full-time, but I’m still quite active, presenting at conferences and participating on social media. Many different reasons. Personally, it is just my happy place. I love to sketchnote, knit, macrame, and do things with my hands. It calms me down. I decided to turn what makes me happy around and make my classroom a creative classroom. In teaching French, I start off with a 10-minute overview and then the rest of the time my kids would be creating something mostly with technology. It completely changed the atmosphere of my classroom. Students were loving coming to class learning there and then using the structures taught in my French class showcase what they learned through the projects they created. My sketchnoting started about three years ago when I noticed these drawings related to education and they were called sketchnotes. So I decided to give it a try. I stopped drawing when I was around 1o-years old because I thought I wasn’t very good at it. Then when I tried 3 years ago on my iPad and rediscovered my love of drawing. There are several apps on the iPad that you can use for sketchnoting. I use the app Procreate because it lets me capture and export my drawings while I’m drawing in a video. If you look on my youtube channel, I provide many a playlist of live sketchnoting. People don’t realize that there are links to all the drawings to share with educators in my book. Sketchnoting has really taken off this past year. If you look at the hashtag #sketchnoting, you can see how it has grown. It is also great for students to put their thoughts to paper with visual thinking. Depending on the devices available in the classroom, it is okay to do analog drawing with students. I find I can draw on the iPad better because I can zoom in which is easier for me. It’s one of the keynotes I love to do. It is about the ideas based on a book that I read “Bounce: The Science of Success” by Matthew Syed who wrote that there is no such thing as natural talent. That anyone can achieve talent an area of their choosing as long as certain preconditions are met. You’ve used the Iceberg Illusion which is crazy how popular is. 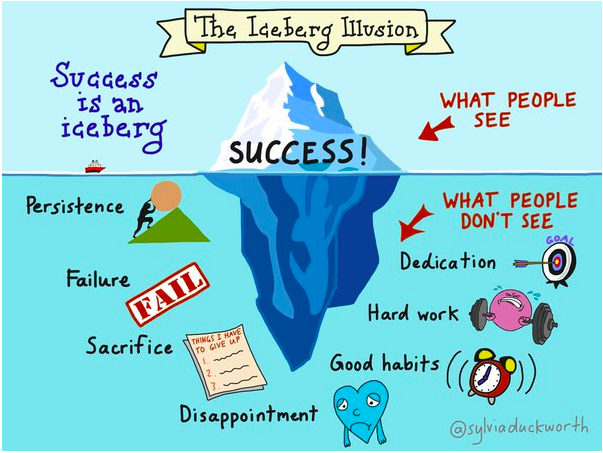 The top of it is Success and underneath is what we don’t see in creating success. I include that in my Talent Myth presentation. You can learn to draw, you just have to put your mind to it. It is our role as teachers to help our students find those talents.We need to give them the opportunities to broaden their perspective so they discover and explore their own talents. Holly Clark and I have launched a new course on sketchnoting called Making Thinking Visible with Sketchnoting. My family is always amazed how much I loved my job or whatever I’m doing next. When we get together we share our days. I always say I had a great day. A lot of teachers feel that way but there are a lot of teachers that don’t feel that way about their job. One of the secrets at maintaining my passion for teaching has been keeping a growth mindset and wanting to try something different. It is about not relying on teaching the same thing year after year. The best way to get those ideas to maintain your passion for teaching is on social media. Since I joined Twitter about 10 years ago, the ideas, resources, and connections with teachers all over the world, that has really been key in maintaining my passion for teaching. There’s always something new you can try with your students. I never get bored with teaching. You can learn from other teachers on Twitter and not teach the same thing each year. 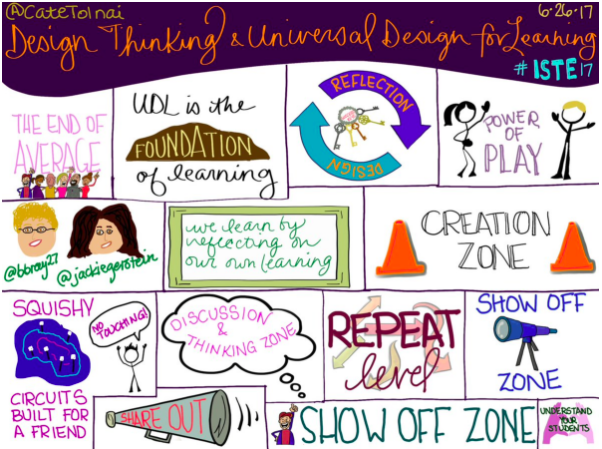 Like I mentioned before I have the online sketchnoting course with Holly Clark called Making Thinking Visible with Sketchnoting. I’m visiting several places including New Zealand in April and will be seeing my daughter. I’m open to doing Sketchnoting workshops at any school or district. I may even create a podcast show myself. As you can tell, every day is fun and an adventure now. Sylvia Duckworth is an avid sketchnoter, AIM French teacher and Tech Coach, Google Certified Innovator and Trainer, Apple Teacher and Apple Distinguished Educator with more than 30 years of teaching experience in the public and independent school systems. Sylvia is an award-winning teacher from Toronto, Canada. Her mantra is “Connect, Collaborate, Create” and she is constantly searching for ways to enable teachers and students to maximize these opportunities. She is a frequent keynote speaker at educational events and the author of the book “Sketchnotes for educators”. Click the links below to see Sylvia’s other blogs and websites. This past year, I decided to step out of my comfort zone. I wanted to try some new experiences, but something was holding me back. I couldn’t figure it out. I think what was keeping me from finding my magic was fear. Fear of not having enough money so I kept taking jobs that kept me comfortable. Fear of looking foolish so I kept doing the same presentations. Fear of letting my family down. Actually, my family was pushing me to go out of my comfort zone. I didn’t realize I had a fixed mindset that I couldn’t do something. It was me holding me back. 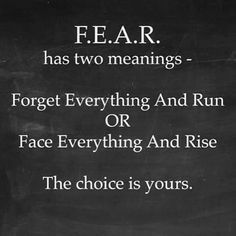 Fear is a valuable thing. It keeps you safe and encourages you to be cautious when you need to be. But fear also limits you. Not everything you’re afraid of deserves fear or caution. Sometimes, courage and bravery are needed to make your life better. 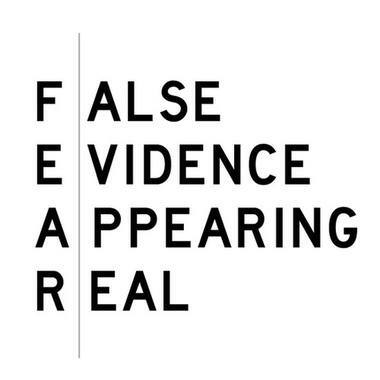 First, review your fears and if they are real. I had no idea I was holding myself back when I didn’t have to. So I took time to address each fear one at a time and talk about that fear. I needed to figure out on a scale of one to ten how real that fear really was. There were no fears in my work that were 10s. I made the fears bigger than they really were. One of my fears was changing the direction in my work. Before I jumped straight in, I needed to identify the direction I wanted to go. 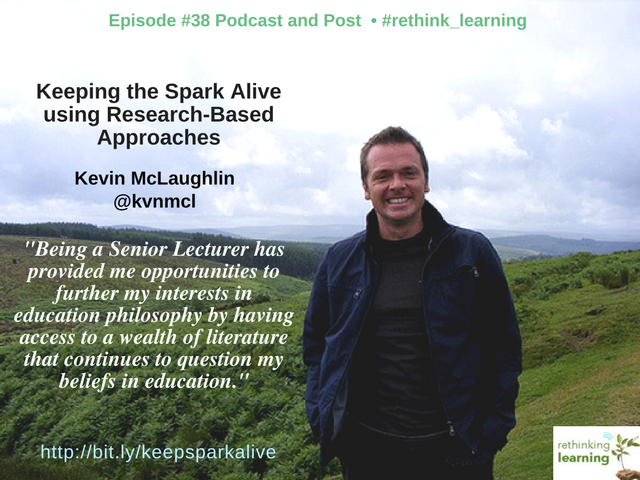 I had been blogging on my website Rethinking Learning since 2010 and before that blogged as Rethinking Learning on My eCoach since 2004. I really love to write and share. I figured the easiest thing to do was to start blogging again around passion, purpose, kindness, and agency. So I did. I’m loving it and writing every day. It’s about going slow and dipping your toes into what you’re passionate about. After I identified some of my fears, I needed to do research on different topics. I needed to reinvent myself. That seemed so big, that I just kept doing the same thing even though it wasn’t working for me. I guess I didn’t feel confident in myself. I needed to get out and talk to people, visit schools, and travel. This is a mental trick anyone needs to do. It is about believing that you can do something if you do the research on what it is you want to do. The research builds knowledge. When you have that knowledge, you build the confidence you need to move forward. Being uncomfortable is kind of the new norm today. The world is changing so fast that no one knows what is ahead for us. There is an uncertainty about the type of work is needed in the future. That impacts all of us. For me, I knew I couldn’t keep going down the same road because it wasn’t working for me and for others. The best habit for me was to practice becoming familiar with uncertainty and discomfort. I try to pick one thing each day that kind of scares me and act on it. The one big thing I did was start my podcast show. Each show puts me out of my comfort zone. I needed to push myself so I did big time. 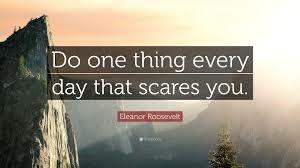 I really recommend the idea of picking one thing each day that scares you and go and do it. You will be amazed at how you will be able to live with uncertainty easier every day and build a growth mindset about whatever you want to do. When you take at least one small step to living uncomfortably and tackle your fears, you will be amazed at what magic occurs within you. There is no word for “retirement” in Japan. The Ohsaki Study  found that some of the happiest and longest living people in the world are from Okinawa, Japan. Their average lifespan is seven years longer than in North America. They have more 100-year-olds than anywhere else in the world. Instead of retirement, they have a word called ikigai (pronounced like “icky guy”), which roughly translates to “the reason you get out of bed in the morning.” It’s the thing that drives you the most. In a 2001 research paper on ikigai, co-author Akihiro Hasegawa, a clinical psychologist and associate professor at Toyo Eiwa University, placed the word ikigai as part of the everyday Japanese language. It is composed of two words: iki, which means life and gai, that describes value or worth. How do we balance all of these factors in the creation of a life which is meaningful, purposeful and aligned with our true calling? Is it possible to have it all? 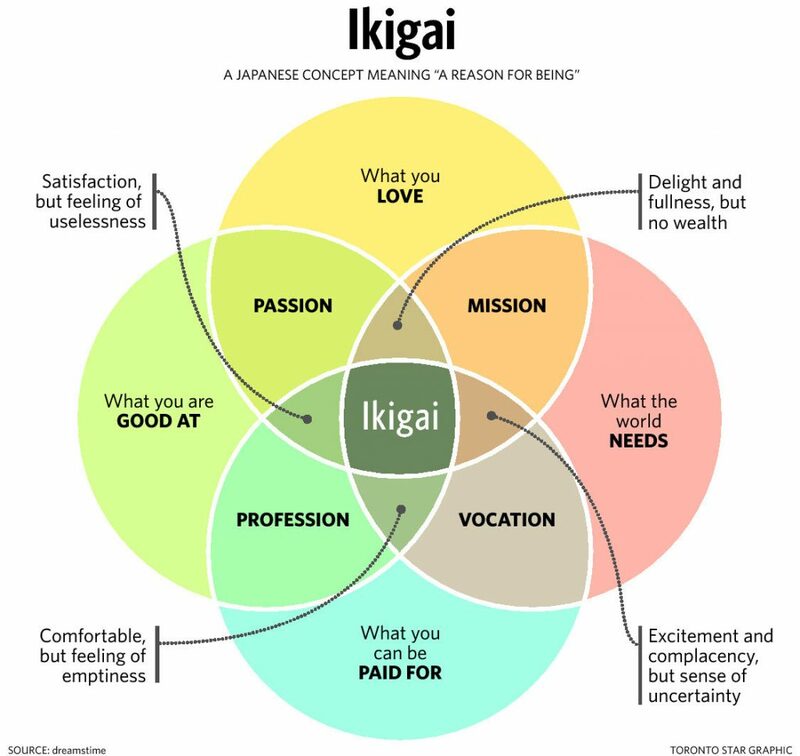 The essence of ikigai gives you a framework to balance these elements into a cohesive whole. 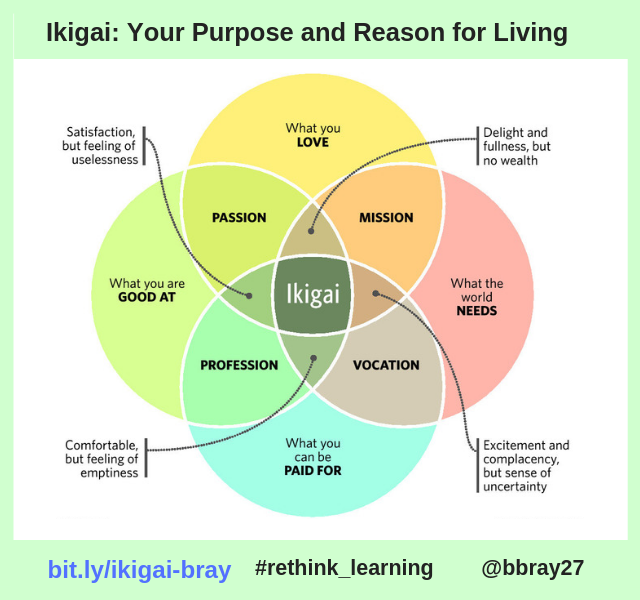 While you can make lists of the four elements above and figure out what it is at the center of them all, finding your ikigai can also be as easy as just stopping yourself throughout the day and ask yourself: Why are you doing this? Listen to Donovan Livingston’s Harvard Graduate School of Education Student Speech all about purpose in the form of a poem. This video touched my heart. When you discover your purpose like Donovan shared, you may find your story and share your reason for living. What is one simple thing you could do or be today that would be an expression of your ikigai? 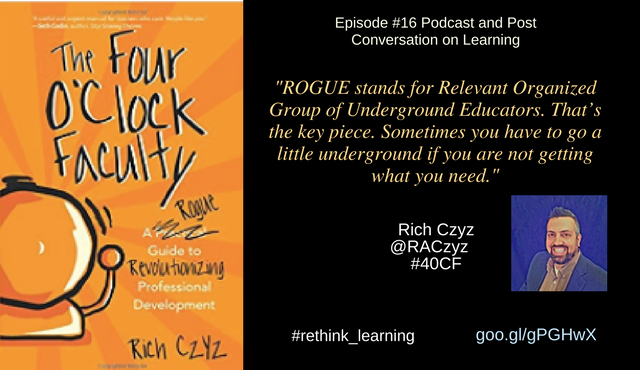 Rich Czyz is Principal of the Thomas Richards School in NJ and Co-Founder of FourOClockFaculty.com and the author of his new book, The Four O’Clock Faculty: A Rogue Guide To Revolutionizing Professional Learning. Can you share with my audience about you, your family, and your background? I live in Bucks County, Pennsylvania with my wife and three children. We really enjoy the area and I work in New Jersey. I started as a fifth-grade teacher and worked my way up through instructional coach to technology coach to a supervisor and then as a director of the curriculum. I felt I needed to be back with students so I took a principal’s job at a wonderful place to be every day in the 2nd and 3rd-grade building. I’m lucky to hang out with kids every day and collaborate with teachers. 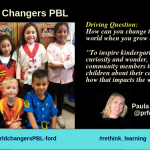 Why are you so passionate about changing the culture of professional learning? I’ve sat through a lot of professional development and been responsible for planning professional development (PD). Sitting through a lot of it, I’ve felt that it is not where it needs to be. My personal belief is that professional learning and professional development is the one thing that educators can do in order to change education. They can take charge of their own professional learning. A lot of times PD is left in the hands of a couple of district administrators or building principal. Leaving it in their hands, sometimes teachers are not necessarily getting what they need. It is the one thing that can really change the outcomes that we are seeing in classrooms. We are missing professional learning and development that is connected to what we are doing in the classroom. Is that why you and Trevor Bryan started the Four O’Clock Faculty and posted tips and ideas often? Trevor and I were colleagues in my first job where he was the art teacher at a new school. When I taught 5th grade, he was my students’ art teacher. We found that we were very similar in our beliefs about education. 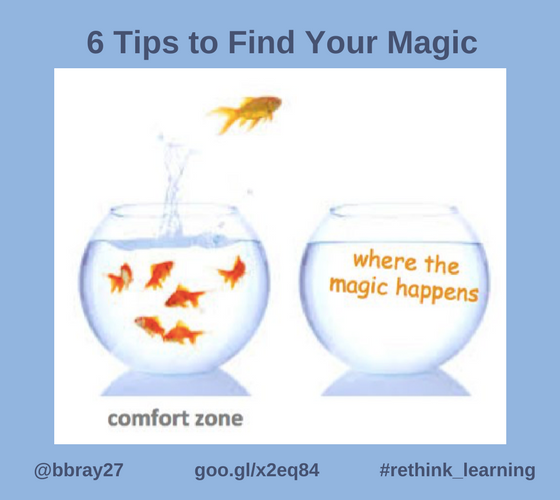 Trevor and I had some ideas about professional learning and development to help colleagues grow and learn so we decided to start a blog and reflect on our own learning. It all started on a snow day in 2015 with unexpected time and decided that day was the day to start our blog, Four O’Clock Faculty. I wrote two posts that day that started it off. It gives both Trevor and I a platform for sharing our message which we think is an important one about really inspiring students with creativity, collaboration, and getting them to authentic, relevant learning. We’re excited about it and we post almost every day. We recognized that visuals and simple messages are what everyone seems to gravitate to. 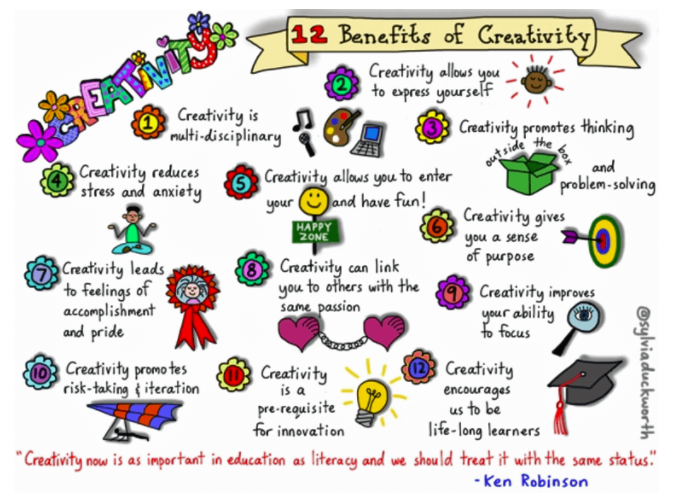 So we create visuals with tips and short messages for educators to learn something in a quick and easy way. Read more about the origins of the Four O’Clock Faculty. 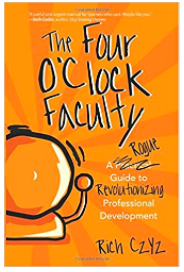 I read your new book, The Four O’Clock Faculty: A Rogue Guide To Revolutionizing Professional Learning. My focus for years has been professional development. Now I call it professional learning and this is the book all of us need to read. Tell me your journey in writing it. It kind of started with a couple of blog posts early on for Four O’Clock Faculty. It kind of blossomed into an idea for a book. I realized that I have a lot to share about professional development that people would enjoy reading about. I reached out to several educators who had written books to ask them about the process of writing a book. I was fortunate to connect with Dave Burgess with his Teach Like a Pirate theme and the Dave Burgess consulting group in order to get the book published. When I first met with Dave, he said: “if this is what you want to do this needs to be your manifesto about professional development and professional learning.” That’s really what I tried to do by stating my beliefs about what professional development and professional learning should look like and hopefully help everyone with tips on how to improve professional learning in their own setting. Why do you believe that professional learning should be meaningful and relevant for educators? What are a few learning experiences that support your ideas of meaningful professional learning? For me, it all started with a learning experience that I had as a second-year teacher when we were implementing a new writing rubric when I taught math and science. The district provided year long professional development on the new rubric, however, it was not something I was using in my math and science classes. At that point, I realized that I was forced to sit here and I’m not using this rubric and that I could use my time more effectively if I was able to work on some other things. It stemmed from that and other things that I saw as an administrator that professional learning is an important piece. A lot of times we are not giving educators what they need. One example I always share is in my former district we used to force our school nurses to come to our staff meetings. When we were talking about language arts or mathematics, our school nurse was forced to sit there and listen. I recognized then that we are not doing it right. So if I’m a school nurse, help me learn about head trauma and where we’re going with concussions in athletics. 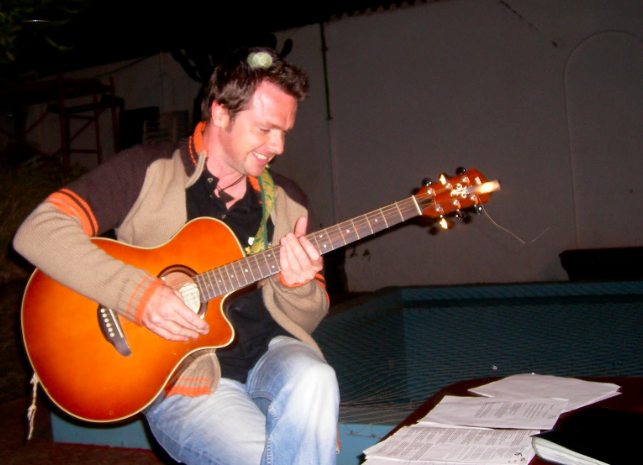 Or if I’m a music teacher, what can I do to help my students learn in the music realm? We need to get professional learning that is meaningful and relevant. Districts can put some things in places like STEAM education or creativity by providing choice and integrating those big ideas into what is relevant for teachers. 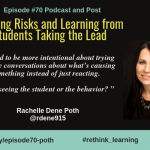 What are a few ways to change a school or district’s culture surrounding professional learning one bite at a time? In my previous district, we would focus on one staff meeting as professional learning opposed to a list of policies and procedures. We also did an Edcamp to take that learning and put the responsibility back on our educators. Even now, as a principal of a 2nd and 3rd-grade building with 40 staff members, we try to focus our monthly meeting on growing as professionals. I like to to do a lot of modeling since that is an important piece of changing that culture. 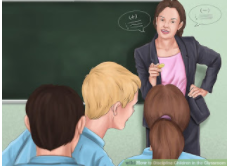 If, as the leader, I’m expected to see a certain type of instruction in the classroom, then I should be modeling that instruction for my educators at staff meetings. That professional learning piece is a huge part of that staff meeting culture. 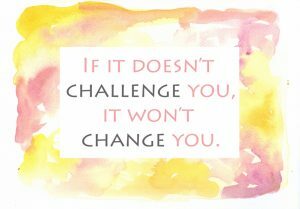 That is where you take one bite at a time because you have to take baby steps because not everyone is ready for the change. There are some people that are so ingrained in how PD has been done that it has to start small and build from the ground up. 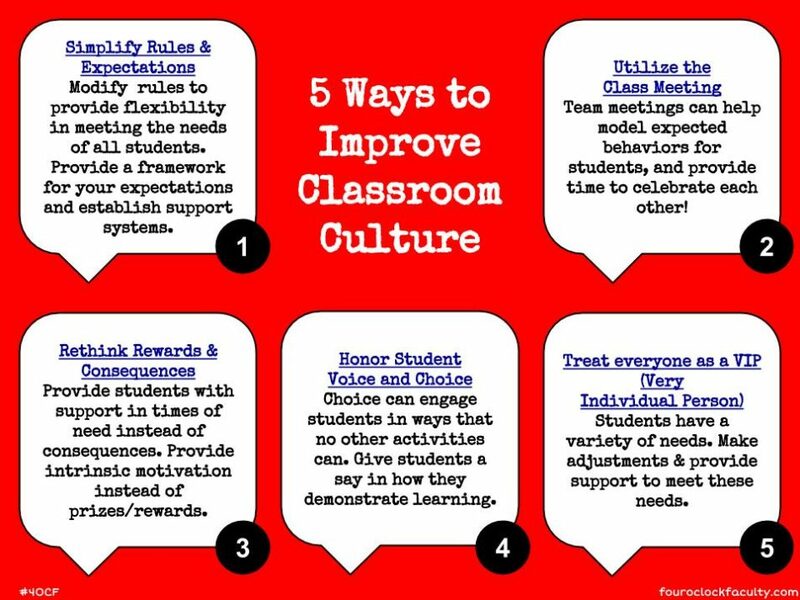 It takes a couple of years, but I think that culture can change around the professional learning. Let’s talk about the “Angry Administrator Update” that you include in each chapter. Do you have a story about this you would like to share? So I believe I think differently than a lot of administrators and there are a lot of great administrators out there who are doing wonderful things. I think all of us need to connect with educators. I will always call myself a teacher first and try to never forget that. But there a number of administrators out there who do get angry when you try to change things. They’re kind of in love with the status quo and doing things a certain way. I just felt it was important to help those educators that were going to try to change professional learning to get that support that they need. So these updates are tips to help administrators who want ideas on how they can change and support their educators. It is about having the best interests of students in mind as well. I have to ask you about the chapter about Going Rogue. Why do you call it a Rogue Guide? 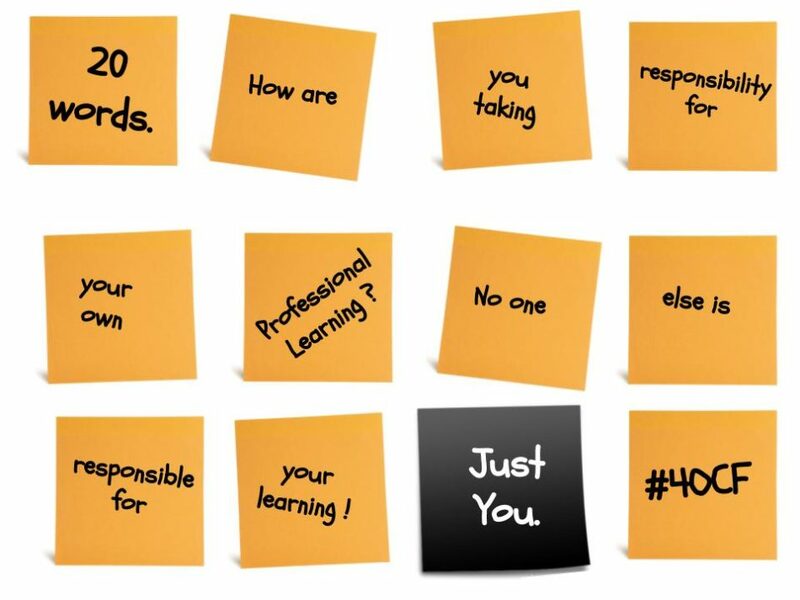 How do you start your own ROGUE professional learning? The ROGUE chapter actually started as an early morning writing experience before I started my day with the kids and getting off to work. It was one of those inspirational mornings where I had recently talked to a colleague who was forced to sit through staff meetings that were just a list of procedures and policies. 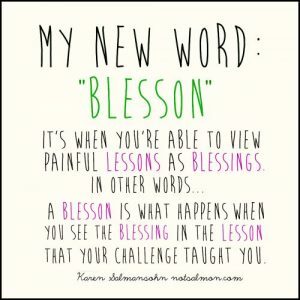 That colleague and a couple of others at his school decided to start their own weekly group where they read a blog post and meet to reflect on it. That’s kind of where that ROGUE spirit comes from and getting what they need. If they’re not getting what they need from their administrators or from the school district, then I believe it is important to get what they need on their own. I see educators at Edcamps on Saturdays who take time out of their personal lives to be together to grow as learners. I feel it is our responsibility as educators working with students to make sure we are doing everything we can to learn professionally. ROGUE stands for Relevant Organized Group of Underground Educators. That’s the key piece. Sometimes you have to go a little underground if you are not getting what you need. The one thing that is a real problem that I hear from teachers is time. Where can educators find extra time in their day to incorporate personal professional learning? There is a chapter on Time. As educators, we tend to put more and more on our plates. It seems like there is never enough time to do all the things that we used to do. One thing I would suggest is first to find those things on your plate that are not relevant or meaningful and not effective. There are things that we have been doing as educators that we continue to do just because we’ve been doing them. Those things probably can go so they can find more time for those things that are meaningful, relevant, and effective. As far as the professional learning, from something as my previous district, our teachers were required to be in the building 15 minutes before the day started and 15 minutes after the day ended for students. So we took those extra 15 minutes before and after to learn something new. We did something called Tech Mex Tuesday combining that idea of Taco Tuesday and Tech and sharing with teachers. We would start right when students got on the buses and show a relevant tech resource along with chips and salsa. What usually happened is that teachers that were learning something stayed longer than the 15 minute required time to continue their own learning. Lunch time is also another time for learning even though it can be the only time that teachers get to themselves. But taking once a week or even once a month to sit down with colleagues and learn something new during that lunchtime can be an important step as well. That first step might be finding those ROGUE educators as collaborators who want to make learning better for students. Let’s talk about Twitter. That’s how I met you. How did Twitter change your view on what is possible for education? So Twitter completely changed my worldview. Before Twitter, I was the educator that was not connected. I swore off Facebook because I was told that students and parents would try to connect with me and I was told to stay as far away from that as possible. I attended a professional learning session at a conference where they were talking about Twitter, and I was able to open an account. I let it sit for a couple of months and then I came back to it. I saw people were sharing relevant resources and ideas. I was finding things that were helping me. 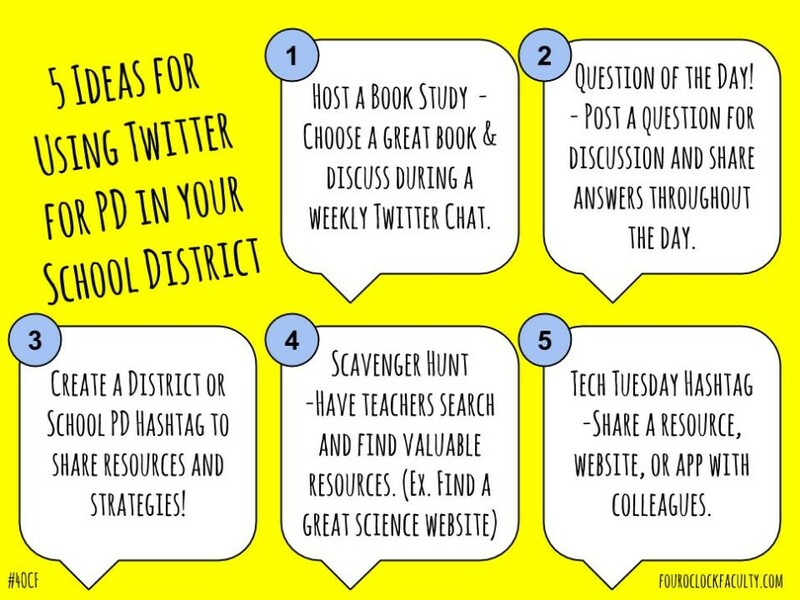 The next thing I jumped into Twitter chats that are amazing sources of information for educators and just really connecting. 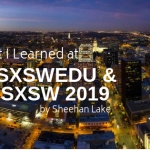 So, the idea that I was able to connect to you and other educators out there was amazing. Now when I see you and others that I met on Twitter at a conference, I feel like I’ve already known them. Twitter allows that personal connection even before the face-to-face meeting. Twitter allows for that collaboration and sharing and extends learning beyond your four walls. Would you like to add anything more for my audience? I’d like to add what we are doing on the Four O’Clock Faculty blog posting micro-learning sessions. They are short videos around 2-3 minutes each. The idea is from my children who do martial arts where their instructor would do these short videos of skills. He would teach the skill, have them practice, and then jump into another skill. I was thinking about that in terms of education, so we created these micro-learning videos where teachers can get an idea of a skill or something that they can practice. Then there’s a call to action on how they can take that idea and bring it back to their classroom. 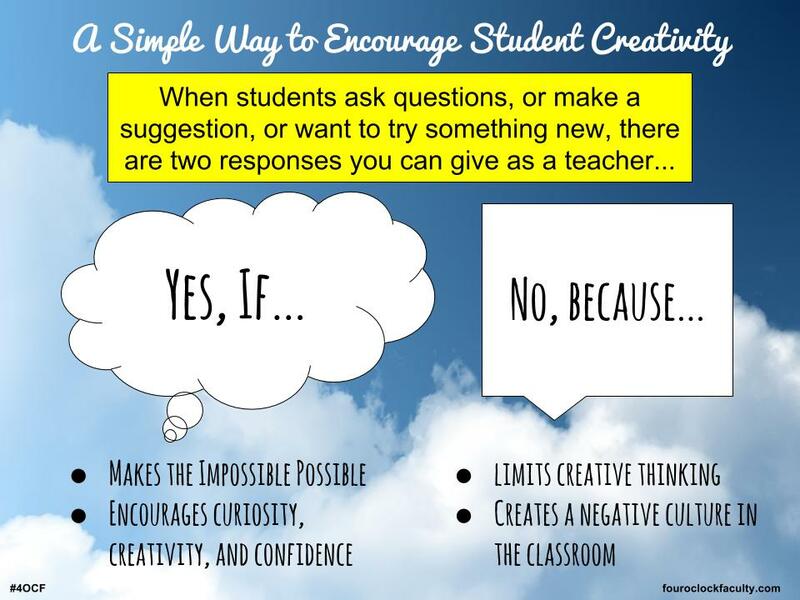 For example, one idea was how to ask more effective questions in the classroom and how to get students questioning. The call to action was to have teachers to write 10 really good questions that they want to ask their students during that week. The micro-learning sessions are another way that educators can practice skills in a short amount of time frame. Rich Czyz is Principal of the Thomas Richards School in New Jersey. He is the co-founder of the Four O’Clock Faculty blog, which can be found at fouroclockfaculty.com. He is the author of The Four O’Clock Faculty: A Rogue Guide To Revolutionizing Professional Learning. 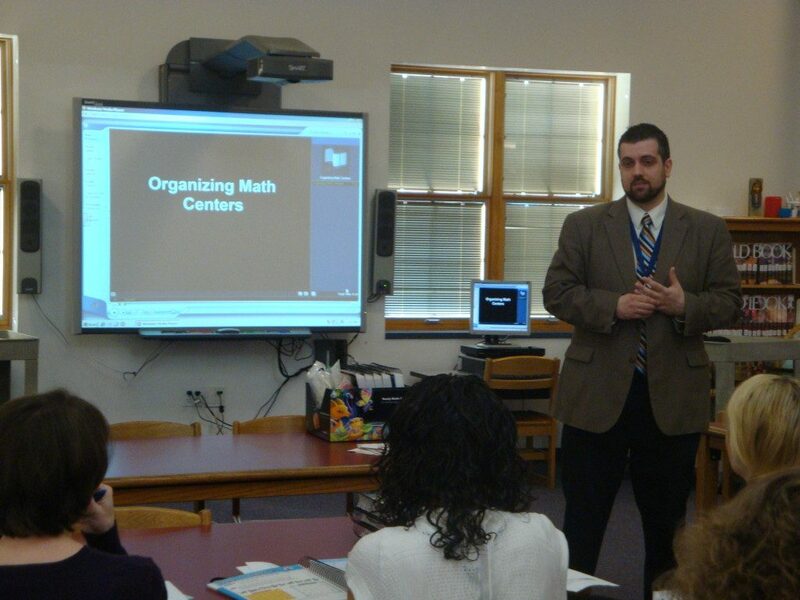 Rich has a passion for modeling and implementing innovative strategies to help learners and teachers improve every day. Rich is active on Twitter (@RACzyz) #40CF and can be reached via email at richczyz@gmail.com. The problem with “kind of” listening is that it can lead to mistakes, misunderstandings, the wrong goals, wasting time and lack of teamwork. 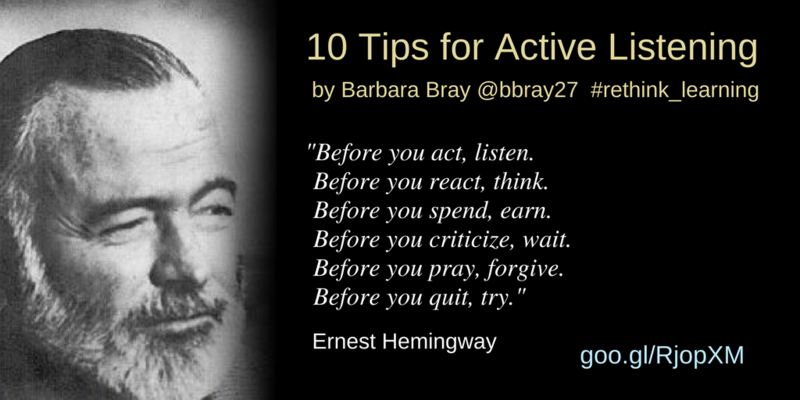 I love the quote in the graphic above from Ernest Hemingway. There are so many reasons for us to pause before we act. This pertains to listening as well. As a coach, I learned the importance of careful and thoughtful listening. Yet, I still have to remind myself about active listening. Some people think they are listening but to build positive relationships that work, they need to listen well. They may be listening just enough to jump in to say what they want to say. Some have trouble concentrating on what the other person is saying so they zone out or daydream while the person is talking. There are others who think they are listening but actually are thinking of all the things they want to say or need to do that day. Listening is less important than how you listen. By listening in a way that demonstrates understanding and respect, you build a true foundation for a good relationship no matter if it is between coach and coachee, teacher and students, friends, mother and child, spouses, or team members. Decide you want to listen: Remember the old adage about having two ears and one mouth. Maybe we’re supposed to listen twice as much as we speak. Whatever, it starts with the decision to listen. Come with an open mind: It is very easy to come to a conversation with a preconceived idea about the other person and what they are going to say. Give them a chance to surprise you and you surprise them with an open mind and listening well. Hear what they say: Make sure you can really hear the other person. It is surprising how often people do not realize that they cannot even hear other people. Make that you can really hear them first for effective listening. Let them know if you cannot hear what they are saying. Give 100%: Show you care about the other person or persons by giving 100% of your attention to them and suspending all other activities. If you multitask while listening, you are not listening. Listen 75%, speak 25% of the time: This is a powerful tip unless you are giving a speech. Try to allow the other person to speak more than you and listen to them. Show interest: While the other person is speaking, lean forward and maintain eye contact. Be sensitive to their cultural background while listening. Some cultures find smiling offensive. Some people talk with their hands. When you are listening, use similar cultural gestures and actions. Let the speaker finish the point they were making: Our brains speed along four times faster than when we speak. Try not to finish their sentences or interrupt. Wait for Pauses. When the speaker pauses, you might be able to jump in and ask a clarifying question. If there are not good long pauses, then wait until the speaker has completed speaking their idea. Show understanding: Just saying “I understand” is not enough. People need some sort of evidence of understanding. You can demonstrate that you understand by occasionally restating the idea they were sharing or ask them a question that probes deeper into the main idea. Try not to repeat what they said just to prove you were listening. Active listening means you can show you understand what the other person is saying. Respond with interest: You can demonstrate you received the message and how it had an impact on you. When you respond, speak at the same energy level as the other person. This will help the person who is speaking that they really got through to you and will not have to repeat what they said. Be respectful: Let them know you take their views and ideas seriously. Be willing to communicate with others at their level of understanding and attitude by adjusting your tone of voice, the rate of speech and choice of words to show that you are empathetic and trying to imagine being where they are at the moment. This is a repost and update of an earlier post I did in 2010 on active listening. You are welcome to add any tips or ideas on active listening below. 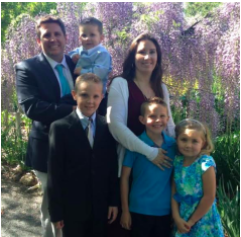 Ryan Sheehy is principal of Highlands Elementary School in Concord, CA. He is in charge of executing the school’s vision, building and implementing an instructional framework, and collaboratively working with staff and community to design a school that is student focused. I was introduced to Ryan Sheehy by Adam Welcome who had a conversation with me earlier [Running Because Kids Deserve It]. I first connected with him on Twitter and it became really apparent how passionate he is about doing whatever he can for kids. Ryan came up with something I just had to share with my audience. Be the One! Below are excerpts from the podcast I had with Ryan. Enjoy! Can you tell me about you, your family, and your background? How did you come up with Be the One for your blog? Why is it important for you to write about this? I met Adam Welcome who was my vice principal in another district, and he encouraged me to start blogging so I took the challenge. I try to put out one or two blog posts a week. This is something I feel very passionate about. I found my voice through blogging. 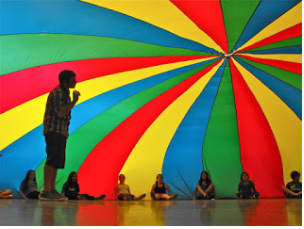 I’ve worked at 14 different schools because I was an elementary physical education teacher working at 3 to 6 schools at a time and every staff room had one thing in common. People were scared to take that step to go outside the box and “Be the One” that changes it. You ask 2 questions in your blog “Who Tells Your Story” to teachers that tell you everything about the climate and culture in their classrooms: How do you connect with your families? How do you tell your classroom story? Why these questions? When you walk into a classroom, you can instantly get the feeling in the classroom. Is this teacher showcasing everything they are doing in their classroom? These tell you how invested they are in their kids. We as an education profession have a hard time bragging about all the wonderful things that are happening in our classrooms. Most of us are in this for the right reasons, and we really need to showcase that. We need to “Be the One” that tells those stories. Too often we hear about all the negative things that happen in education and rarely hear the positive things. We know that there are negative things that happen and constantly face adversity. 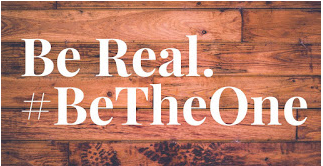 We can “Be the One” that flips the script and tells the positive story. 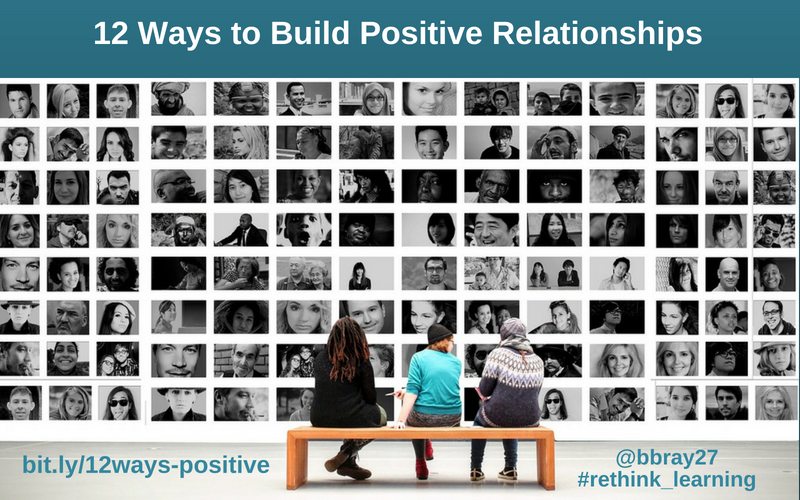 We can flood positivity through social media, newsletters home, and any other ways we connect and communicate to share our successes with everyone. Back to the two questions, I ask these questions when I do presentations with teachers and they tell you how invested they are in it. 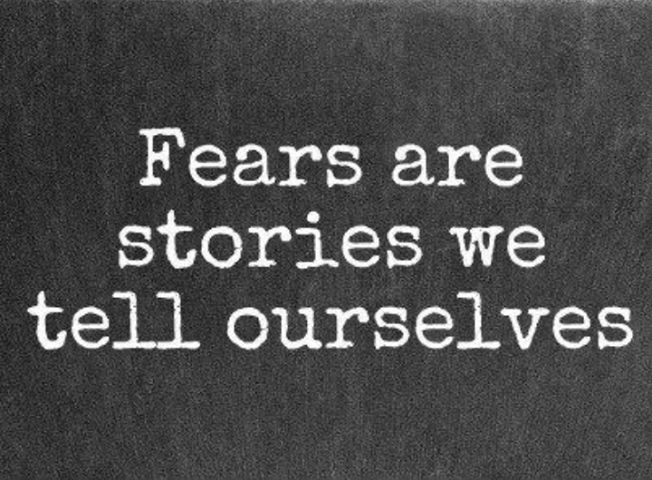 Too often we are afraid to tell our stories. They just need that extra push. It may feel like bragging, but it is showcasing. As a profession, we have so much power to share. 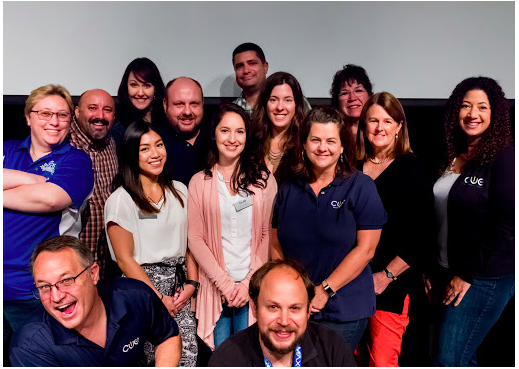 Because I am connected with principals across the country, I’m able to take what they are doing and reshape it for our teachers in Mount Diablo Unified. Blog post Who Tells Your Story. In a blog you wrote about relationships, you mentioned that you need people that challenge your thinking, not just like-minded folks. Can you share why relationships matter? Relationships for me are the center of my world. As a teacher who went to different sites one day a week made me dig deeper about my teaching and how to create those relationships with teachers and students. On my first few days of teaching, I was thrown in right away with about 120 kids in each class. At one high poverty school where gangs were on the black top, kids were looking for positive role models and connections. Where do you learn about the school? On the blacktop. Another post was about Everyone Needs an Advocate. Who was your advocate? Why do our kids need advocates? It’s all about building memories and a positive environment. 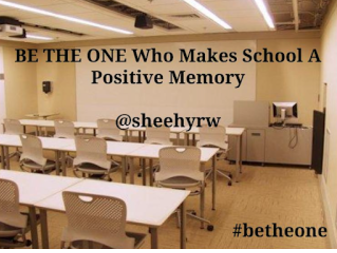 What if educators share their memories (good and bad) with kids? Is that okay to be vulnerable? Vulnerability and sharing those real life experiences is huge. That’s going to look completely different in elementary school from high school. That’s what people need to be careful about. We don’t have to always go into the details. I swam and played water polo in college, but when I went to Cal State East Bay, they didn’t have water polo. So I joined the cross-country team. I wanted to be part of a team, and I was horrible. I came in the last place in almost every race, but I did it. I was consistent on it and stayed with it. It is not me gloating when I share these stories. It’s okay to fail. If we can relate our stories back to that it is okay to fail, model that and share our circumstances, then that’s a win. FAIL = First Attempt In Learning. We need to create a culture at our school where it’s okay to fail. That’s one of my big messages this year to my staff and students. It’s something I started last year. I tell kids that I fail on a daily basis. Kids come up to me and say “Mr. Sheehy, fail harder.” I tell them that it is okay to take those leaps and chances to do that. I just saw another new post from you about Keep Them Moving. Why do you feel it is important for kids to keep moving? It takes me back to my physical education days. It was hard to be at some many different sites and not be part of the staff because you are always moving. One of the things I used to do was write for physical education journals and websites. I would write about how we can enhance physical education. Kids need to be moving so I wrote this latest blog for some easy ways to get kids up and moving. Physical education is not an outside class like in secondary schools. Teachers, especially in the elementary level, can get kids moving every day in their classrooms. My latest blog post is about being the one that gets kids moving but not take them away from the content. It is about using physical activity to enhance the classroom experience, enhance the curriculum and enhance relationships. You will see kids more engaged. So Keep Them Moving. What are you going to be doing this coming year? 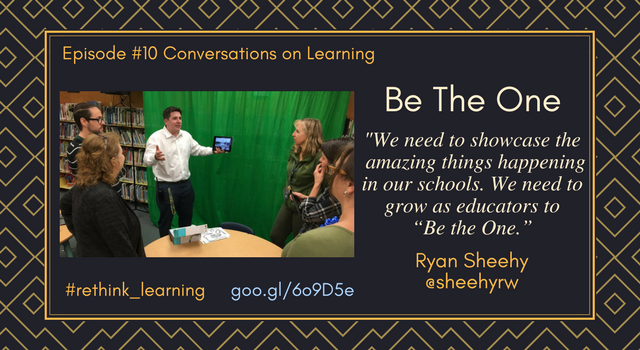 Ryan Sheehy is principal of Highlands Elementary School in Concord, CA. It is a TK-5th grade school with approximately 650 students and 75 staff members. He is in charge of executing the school’s vision, building and implementing an instructional framework, and collaboratively working with staff and community to design a school that is student focused. Ryan is also an adjunct professor in different credential programs and teaching classes to special education and administrative credential programs. Professional learning encourages personal growth by teachers, but many professional development (PD) programs are designed around the “one size fits all” approach. A district may mandate that all teachers have to attend specific sessions around the district mission. Did the teachers have a voice in creating the mission? 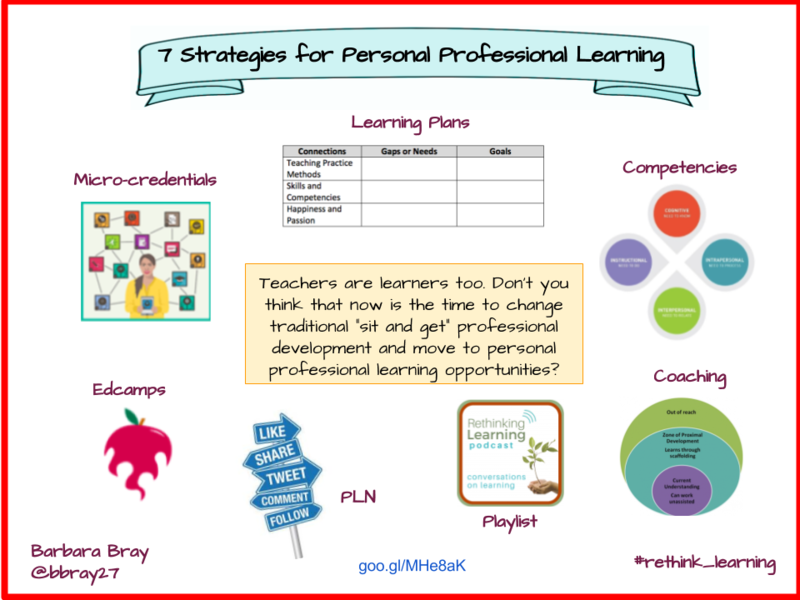 How does your school or district’s PD support teacher’s personal professional learning goals? Teachers are learners too. What if teachers take charge of their own professional learning by reflecting on the process and demonstrating evidence of learning? What if there was a way for teachers to propose strategies that support exactly what they need for their own professional growth? What if teachers have time to develop relationships with colleagues to learn from each other? Don’t you think that now is the time to change traditional “sit and get” professional development and move to personal professional learning opportunities? Personal learning involves the goals we have for ourselves to create a meaningful and fulfilling life. 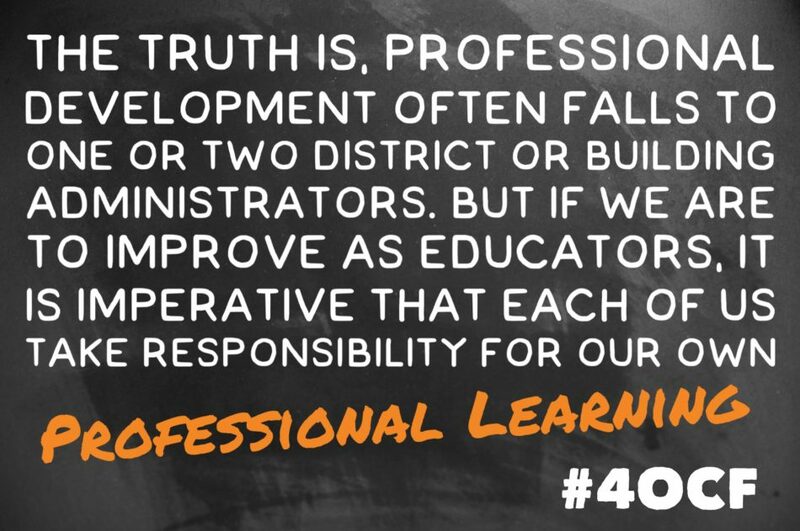 Professional learning involves the skills we need to be successful in our job or career. Teachers can set goals that provide a personal connection to their professional learning. Teachers can do this by identifying a gap in their skills, methods lacking in their teaching practice and what makes them happy and are passionate about. 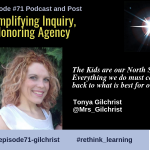 After they identify any gaps and needs, they connect the goals to address strategies that are relevant and meaningful for them and meet learner outcomes. 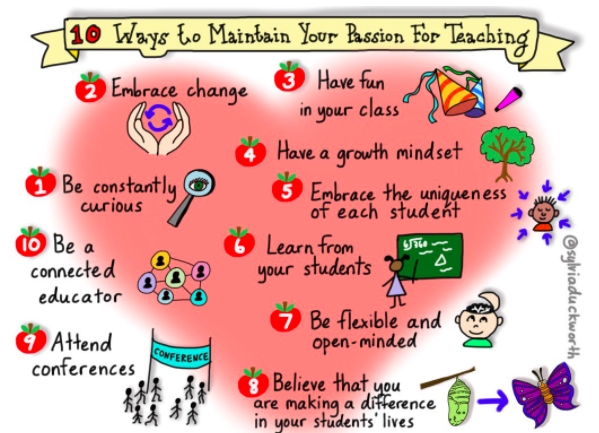 When teachers are passionate about what they do, learners benefit. 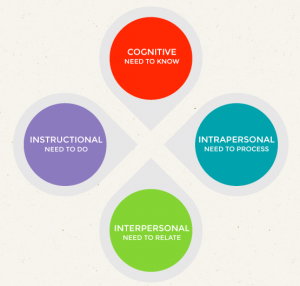 The Educator Competencies for Personalized, Learner-Centered Teaching identify the knowledge, skills, and dispositions that educators need in order to create and thrive in effective personalized, learner-centered environments. The Competencies are organized into four domains—Cognitive, Intrapersonal, Interpersonal, and Instructional along with the guiding principles developed by the Council of Chief State School Officers (CCSSO) and Jobs for the Future with the interactive version at Students at the Center Hub. Teachers can review the competencies when they are designing their goals. Personal professional learning is all about change. Change takes time and doesn’t happen overnight. 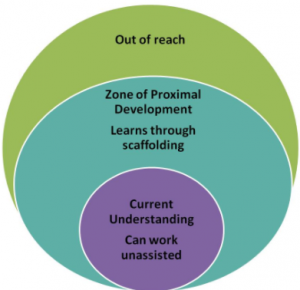 Vygotsky’s theory on the Zone of Proximal Development (ZPD) is the distance between a student’s ability to perform a task under adult guidance and/or with peer collaboration and the student’s ability solving the problem independently. 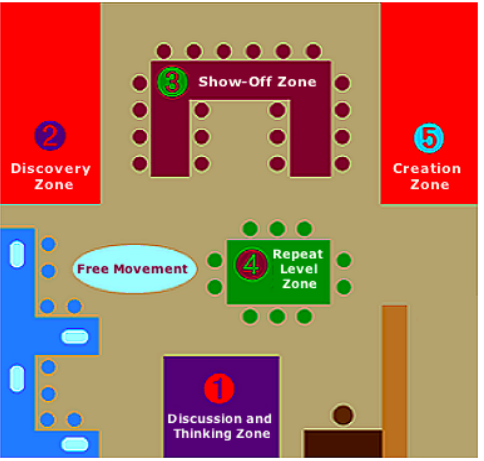 According to Vygotsky, learning occurred in this zone. ZPD is where teachers can learn with support from a coach. A coach can be a colleague, administrator, mentor, or even a student who nudges and nurtures the teacher to research strategies to meet their goals. When a teacher has support from anyone anywhere, they are more open to taking risks and trying new things. When teachers are addressing something they are passionate about and learner outcomes, that’s how change happens. I know when I want to learn a skill like how to fold a scarf, I go to YouTube. I know kids do that. Add videos to your own YouTube channel. Here’s a link to how you can create your own playlist. If you are looking for inspirational videos, go to the Teaching Channel and bookmark the videos that can help you address the gaps you identified in your teaching practice. When I’m in my car on a long drive, I listen to iTunes U on podcasts that I subscribed to. Some podcasts open doors to ideas you might not even know about until you hear them. 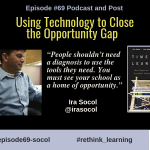 Here’s a link to my podcast series, Conversations on Learning with awesome educators. T eachers can develop a Personal Learning Network (PLN) with educators at their school and beyond. 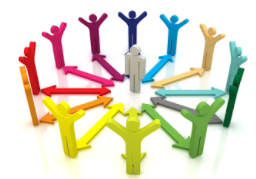 A PLN is all about fostering collaborative relationships. They can make connections and build personal relationships with educators and experts globally. Social media opens these doors. No matter where teachers are in the world, there’s always someone online available to share their expertise, chat about what’s happening in their lives and classrooms, and provide resources. Teachers can collaborate globally on projects. Digital Promise offers micro-credentials to provide competency-based recognition for professional learning that provides teachers with the opportunity to gain recognition for skills they master throughout their careers. 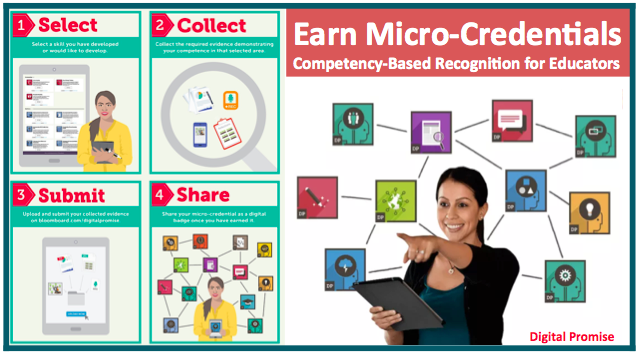 The micro-credentials provide teachers a new way of demonstrating evidence of learning through the eyes of their learners. They share examples of work and reflections from learners along with their own reflections. Read more about Personal Professional Learning through Micro-Credentials. Edcamps are un-conferences. Topics for sessions are determined by participants at the event, where conversation and collaboration are paramount. Educators who want to learn and collaborate are welcome, at no expense to them. There are no planned sessions. Participants suggest topics and vote on which topics they want to be part of. A schedule is built so participants can choose from different topics each hour. The “rule of two feet” empowers participants to find sessions that best meet their needs. If a session isn’t working for them, they are encouraged to find one that is. Teachers find the un-conference feel works when they choose the topics that help them meet their goals. 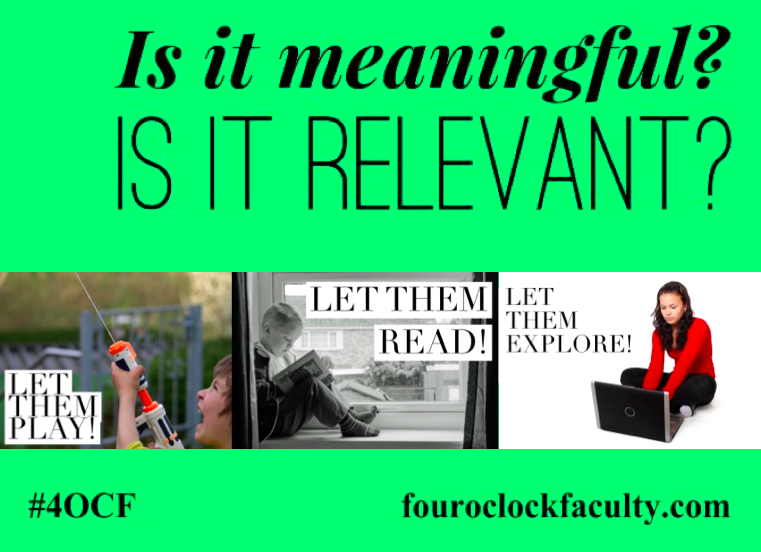 What are you doing to make your learning relevant, meaningful, and joyful? More schools and districts will redesign job-embedded professional learning around the needs of each teacher by offering some of the ideas above along with book studies, lunch and learn and even meeting over coffee (Coffee EDU). We will see a change in teacher evaluations moving from teachers being accountable for test scores to a collaborative community of learners based on the competencies. I’ll be taking these ideas deeper in future posts. If you have any ideas or resources to share, please add them as comments below.